It’s the only training aid [I] use. The Putting Stick entered the LPGA through the Korean players a number of years ago when a US instructor associated with the US Golf Schools was working in Korea and introduced it through the head of the Korean PGA. Because of the cultural rules and player management contracts we cannot list the players individually, but I can tell you that a majority of their LPGA players are using my Putting Stick- just ask our American players how they were introduced to the STICK. Also, the entire Japanese delegation of players is also “on the stick”. Owner of TPK and Inventor of the Putting Stick. Sir Nick was introduced to the Putting Stick prior to competing in his last Open Championship. It helped his putting. 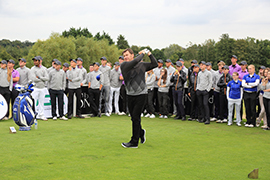 He liked it and understood what a great training aid it could be for young golfers, and so it was introduced worldwide to the finalists of the Faldo Series. 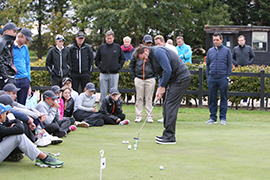 Now the Faldo Series has its own Putting Stick and with each purchase of a ‘Faldo Series Putting Stick’, TPK will make a contribution to the Faldo Series to help develop tomorrow’s champions. While coaching at Idaho, I kept stats on all our players from the time I started. After receiving the putting sticks from TPK since my arrival at Idaho, our team lowered its putting average by 1.7 strokes per player after the first year. 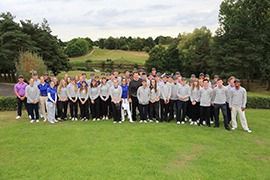 In team golf, which counts 4 players, that is an almost 7 strokes per round difference, and for a three-round event, that is 21 strokes. If anyone looked up our scoring averages, they would see this to be true! 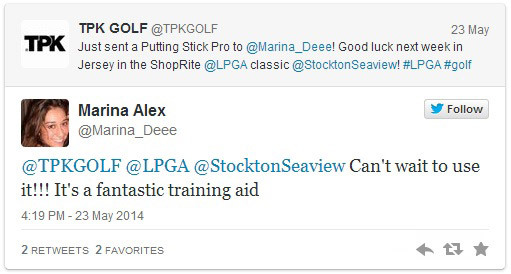 Just sent a Putting Stick Pro to @Marina_Deee! Good luck next week in Jersey in the ShopRide LPGA Classic. I have been using the Putting Stick for 3 years—practicing weekly with it at home-and find it an excellent help to my putting routine. Met you at the PGA Show—I am clinical and sports psychologist that works with the PGA and LPGA golfers, as well as numerous collegiate and juniors across the country. I bought a putting stick to try it out and the results have been tremendous. I want to speak with you about setting up a program for my players to purchase them as I will make sure that all players have one! 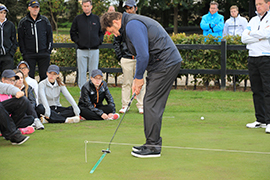 The Putting Stick is a valuable training aid to not only my teaching but to all of my students. The Putting Stick provides excellent feedback to my students in many different important areas, but most important it provides instant feedback on how the putter face is aligned relative to the putter path around impact. For a national stroke, the path can be more or less arched, but returning the putter face back to square at impact provides instant feedback to my players. I had been looking for the Putting Stick since seeing it on TV with Boo Weekly using prior to a round. I couldn’t find it anywhere and I recently saw the ad in the PGA Magazine. I loved the idea and have always been using a string and two pencils as an alignment and path aid. I love the mirror as a set up check, and the versatility of the many uses of the putting stick. I have sold 3 in the first week, and created a buzz by leaving it on the green and letting customers try it. I am very happy with the product and found it useful for both my juniors and my adults. Great product!!! 7. Every junior player that comes into my training center I very rarely use training aids with my students because I find very few that actually work. The Putting Stick has proven itself with scientific evidence as well as pure results with the players I work with. 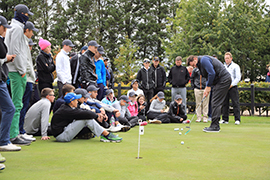 By utilizing the Putting Stick, we can gain precise feedback about a student’s putting stroke. Lack of feedback is the chief reason golfers do not improve putting even with practice, especially incorrect practice. Most importantly, it teaches the students to learn without the thought of mechanics. The Putting Stick allows golfers to continuously monitor backswing length, showing when the backswing might be too long. The Putting Stick shows the accuracy of a square blade at impact since the ball will roll off the stick if not struck correctly. The attached alignment mirror allows golfers to monitor if their eye alignment and setup are correct throughout the practice sessions. If golfers spend 10-15 minutes a day of proper practice with square-to-square or inside-to-square-to-inside strokes on the Putting Stick, it will change their life on the greens. 1. With the new feature of not having the attached mirror [Pro version] and having it on the stick itself, it makes it convenient to carry around with you in your bag. 2. It quickly gets students to realize their faults and gives instant feedback on whether or not they are doing it correctly. It helps get the putter square at address, helps to ensure their eyes are over the ball, and forces the student to make an accelerated stroke. 3. It gives players confidence that they can be aggressive with their putts and if it goes 3 to 4 feet by, they know they can make that putt coming back with using the putting stick. 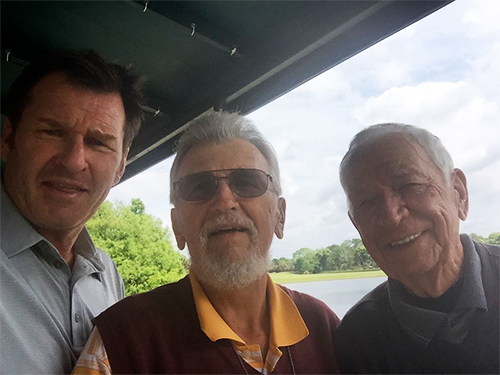 A success story: I had a member of Hazeltine National Golf Club buy the Putting Stick four days prior to a big member, 36-hole stroke play event. He was struggling with his putting and quickly realized it had a lot to do with his setup. His eyes were not over the ball, and his putter face was closed at address. 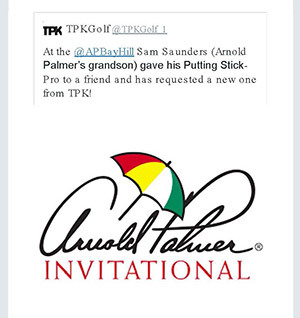 He used the putting stick 10 minutes a night prior to the prestigious event. He feels much more comfortable in his setup, which has freed him up to think more about making a good roll on the ball. With the putting stick it forces you to make a good roll, if you don’t it won’t stay on the stick! 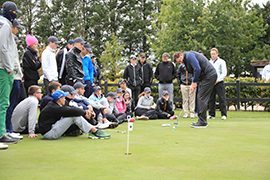 Mike Barge, Director of Instruction at the Hazeltine National Golf Club in Chaska, MN, joined the list of top teaching professionals who have found that using the Putting Stick as a training aid has been beneficial for their students. The Putting Stick will give you immediate feedback on your stroke, which is crucial for learning. I recommend it to all my students as an indoor training aid to use over the winter months. The more success you have rolling the ball along the Putting Stick will lead to more confidence on all putts, especially the short ones. This is the best training aid at the [PGA] Show. The Putting Stick is a wonderful practice aid. You only have control of the first 3 feet and the putting stick helps you perfect that. If you can’t putt with this thing, you can’t putt with anything. My students will have one in their bag, I’ll have one in my bag, and anyone who wants to improve should have a Putting Stick in their bag. ~Jamie Roderick, Head Professional and General Manager at International Club Myrtle Beach, SC. This device will not help you control putting speed. However, IMO there are no aids better than this to work on striking the ball squarely and flush. Any type of miss struck putt is obvious as the ball falls on the rail or barely stays on it. But when you putt the ball properly, you see the ball on the rail. When you get on the course, 3 footers never looked easier. Pro golfer, Chris Naegle, is a new user of the putting stick and reports he likes the focus of the follow through and the ball roll is a big help. 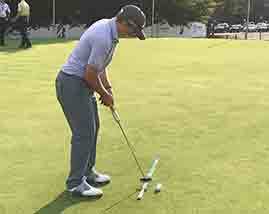 Sebastian Munoz reports that the putting stick "keeps him focused on the through stroke". Chella Choi reports that the Putting Stick "helps greatly with tempo improvement ". New user, Christina Kim: "It simply helps me with a better follow through". P. K. Kongraprahan says, "Its simple and easy to follow her putter back and through for a better down the line putter head finish. Watching the putter blade one foot past impact". Na Yeon Choi reports, " a good tempo-timing trainer". Players taking our Putting Stick- 1/ Tim Wilkinson; 2/ Ben Curtis. Next week at Zurich New Orleans event, then the Wells Fargo, then the Players- a busy run ahead and good successes ahead. Good reception! Several liked and Greg Chalmers (winner last year at Reno) loved and has it in play. The round small level and the ball position mirror he really liked. He's tried several competitor products but said you have the best. Congrats! Leslie Cloots: Belgium’s #1 amateur and playing on the Symetra Tour. The newest user of the Putting Stick! 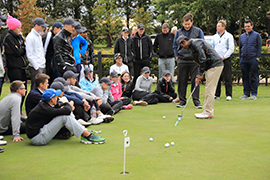 I have found that students really love the training aid used in the short game sessions of the three-day and five-day schools. Most of them tend to take too long backswings, which can create path problems and cause them to not accelerate the putter. The backstop on the back of the Putting Stick serves as a reminder to shorten the backswing. I then urge them to make a longer follow through. Using the Putting Stick with this type of stroke also helps them keep their putter blades squarer at impact. Otherwise, the ball will roll off, going to the right if the face is open or to the left if closed. Its important for students to have their eyes directly over the target line. This helps them to aim correctly. I prefer the original model, with the mirror attached, while others like the pro model with the mirror embedded into the other end where there is an indention to place the ball. I use it myself. 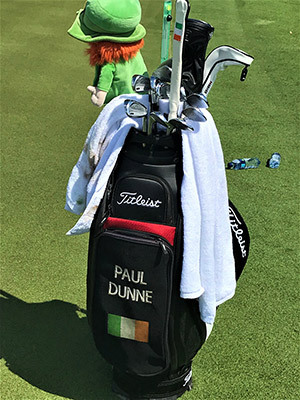 You can't find a better putting aid.